Jumpsuit There are 7 products. 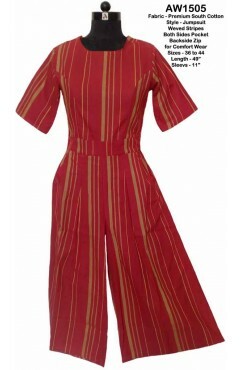 Premium quality South Cotton stripes jumpsuit. Beautiful print combined in western attire. Both sides pocket. Backside zip for comfort wear. 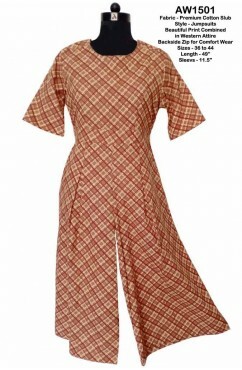 Length 49"
Premium cotton slub floorlength sleeveless jumpsuit in huge flair in beautifuls maroons with both side pocket. Front heavy pintex work, Back long zipper for easy wear, Beautiful cotton slub assymetrical jacket from front & back. Removable belt with pom poms. Length 56" Sleeves 17"
Premium cotton muslin floorlength jumpsuit in huge flair in classy olive greens shade with full cotton lining and both side pocket. Front heavy pintex work. Back long zipper for easy wear. 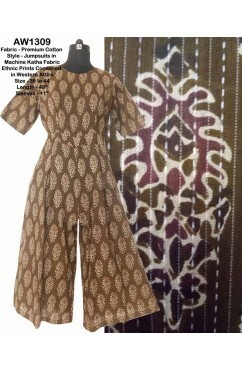 Length 56" Sleeves 17"
Premium quality cotton slub jumpsuits, Beautiful print combined in western attire. A beautiful contemporary fusion dress. Backside zip for comfort wear. 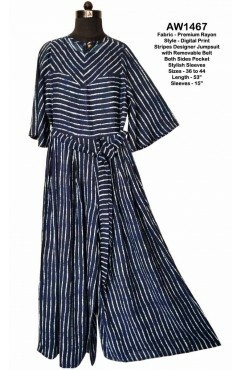 Length 49"
Premium rayon digital print stripes designer jumpsuit with removable belt and both sides pocket. Stylish sleeves. 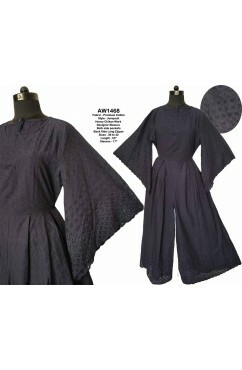 Length 53" sleeves 15"
Premium quality cotton jump suits in machine Katha fabric. Ethnic prints combined in western attire. A beautiful contemporary fusion dress. Length 49"
Premium cotton heavy chikan work jumpsuit with designer sleeevs and Both side pockets, back side long zipper for easy wearing. Length 53" Sleeves 17"